Another useful plant for all but the smallest bog garden. Knobbly tubers send up pink pompoms of flowers in early Spring before the leaves emerge. Bronzy crumpled leaves then emerge on strong individual stems to form a canopy about 90cm high. Tubers are very good for reinforcing pond or stream banks to prevent erosion. A strong grower. Categories: A-D, Autumn, Featured Plants, Plants A-Z, Plants by Season, Plants In Situ, Spring, Summer, The Bog Garden and Bank, The Dew Pond. The “Umbrella Plant”, a giant saxifrage relative, is an absolutely superb specimen that starts off with truly gorgeous sprays of pink flowers on thick stems in earliest spring. 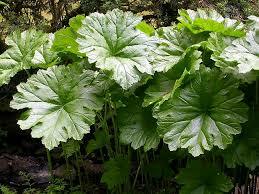 It then pushes up umbrella-like leaves, rather like a gunnera but not as large or sprawly. This stunning waterside plant is especially wonderful in the waters edge, or where it can be allowed to grow large.